Installing crown molding adds beauty to your home like no other type of finish carpentry. Crown molding is ideal for dining rooms, living rooms, libraries, dens, and even hallways. However installing crown molding requires some specific carpentry skills so that you get the finished look you want and don’t spend a fortune on scrap crown molding material. Secrets of installing Crown Molding Correctly! who has installed thousands of linear feet of crown molding. properly measure, select, cut and install crown molding like a pro. 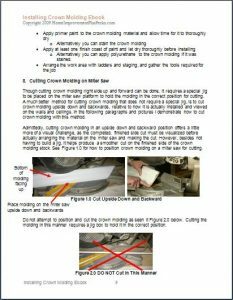 The Crown Molding Ebook includes 28 pictures! In less than 60 minutes you will fully understand what you need to do to properly Install Crown Molding. 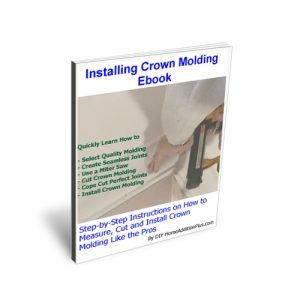 Order Now and Immediately Download the Installing Crown Molding EBook today! The Installing Crown Molding EBook costs only $11 and is 100% guaranteed. Learn How to Install Crown Molding the Right Way!! About the Author: Besides a 40 year career in the aviation industry, an adjunct college instructor, and the builder of a number of homes, Les Donovan is also a master craftsman and an author of short stories and other home improvement articles and Ebooks. His most recent short story titled “The Hermit and the Woodchuck ” was recently published by Publish America and is available on Amazon.com.